Let’s face it: the Internet is becoming a pretty noisy place and building an audience from scratch can take a very long time today. Getting content cited, covered and recommended by prudent media outlets with massive built-in audiences can break through the noise, get your content seen and drive leads, quickly. 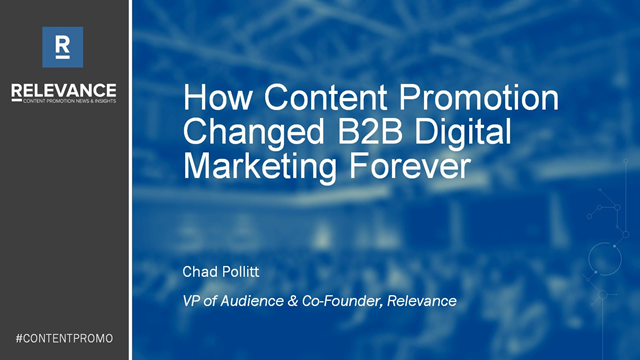 Vice President of Audience and Co-founder of Relevance, Chad Pollitt runs the world’s first publication solely dedicated to content promotion news and insights. He reveals the results of how pitching the media and industry influencers to cover high-impact advanced content can drive millions of media impressions while drastically improving brand awareness, website traffic and leads in the quarter the campaign is launched. He will also break down the different paid native content distribution channels and how they fit in the content marketing landscape.